At the recent Haye-Bellew press conference in Liverpool, which was open to the public, something remarkable took place. We saw Haye emerge from it as the villain while Tony Bellew found himself slotted in to the role of the good guy – the wholesome family man who unlike Haye is in boxing for all the right reasons. Now just think about that for a second. Tony ‘Bomber’ Bellew, a fighter who’s spent his entire professional career unleashing tirades of invective at his opponents in the lead up to fights, whose every second or third word is usually an expletive, a man infamous for bullying and intimidatory antics, suddenly this guy is being depicted as a poster boy for family values and proper etiquette. 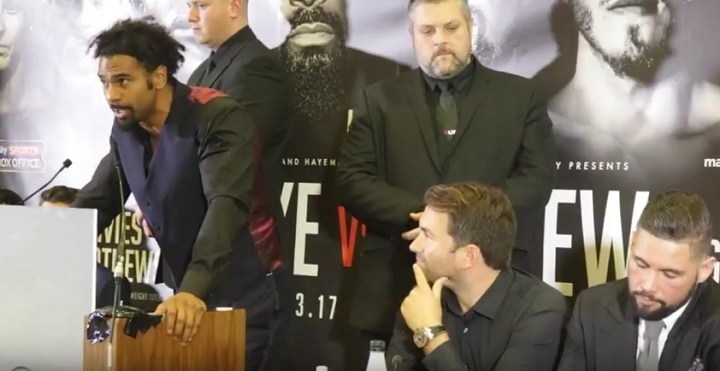 David Haye’s tirade at the presser came after he’d endured dog’s abuse from a crowd that was there baying for his blood. In parenthesis, was there really any need for this particular press conference less than a week before the fight? And, if so, what were Sky and Matchroom thinking opening it up to the public? Surely this was just asking for trouble and the kind of controversy that the sport doesn’t need? Surely if Haye is to be hung out to dry for the crime of bad taste and offensive language, then so should his opponent. But, listen, this is boxing. These guys are ready mentally and physically and emotionally to go to war. Add to the mix the genuine hatred that they have for each other, and what do people expect? Aside from that, the public workout both fighters had with just three days to go dispelled any rumours that Haye’s been having problems with his previously injured right shoulder, or that he was suffering from an achilles problem and is on the verge of pulling out. Yet again the Haye camp has proved adept at mind games. Whether it’s the footage of Haye supposedly training on a yacht in South Beach, Miami, or sitting in a Jacuzzi sipping protein shakes from a cocktail glasses, or his highly publicised visit to his doctor in Munich, they’ ve succeeded in giving the impression that Haye’s preparations have been less than rigorous and injury-free. The exact opposite looks to be the case. The physical nick Haye is in, revealed during his brief public workout when he removed his T-shirt, tells its own story. He isn’t carrying an ounce of extraenous weight, either fat or muscle tissue, and the snap that he’s renowned for clearly hasn’t deserted him either. On the contrary, Haye’s never looked sharper or more focused than he does for this contest, putting his shots together with speed and fluidity. His trainer Shane McGuigan, a guy who looks like he belongs in a Harry Potter movie poster instead of a boxing gym, revealed that Haye has sparred 60 rounds with Bryant Jennings for the fight, which means he’s had excellent work and ideal preparation. Tony Bellew, meanwhile, appears a solid unit. He claims he’s prepared for a “dogfight”, asserting that Haye no longer has the minerals for what he intends to bring. If he and Dave Coldwell, his trainer and friend, are to be believed the gameplan is to take the fight into the later rounds and drown Haye in the kind of gut-testing slugfest he isn’t built or ready for. The smart money says Bellew will be asleep long before that happens. Judging by what we’ve seen this week, it is hard to disagree.